In 1926 the District constructed a wastewater treatment plant and began laying sewers to convey the flow of sewage to this facility. This plant was operated until 2000 when the facility was decommissioned and sewer flows were diverted to a regional plant in Waterbury for treatment. The District today continues to be responsible for collecting sewage and waste flows from the residences and businesses within the District. 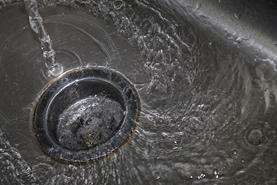 Approximately one million gallons is collected each day by 29 miles of sanitary sewer lines. At the regional treatment plant a combination of biological and chemical treatment processes removes solids and potentially harmful materials before the disinfected flow is discharged to the surface waterway. Precast Manhole structures, bituminous coated, with factory installed watertight flexible sleeves, channels through manholes including shelf to be built of hard burned sewer brick. Campbell Foundry pattern No. 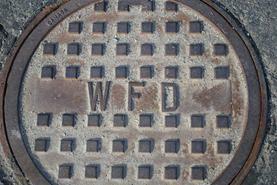 #1027 with the letters “W.F.D.” on cover. Push on type joint or mechanical joint with six inch (6”) 45deg. bend. 6” Ductile Iron Class 52, Cement Lined Bituminous Seal Coat, push on type joint – crushed stone bedding installed to a depth of 0.5 feet below pipe to springline. 6” Tyton Plugs installed at end of lateral. Low pressure air test – The minimum time required for air testing for the 0.5 psi pressure drop from 3.5 psi will be given by the Superintendent.